Thank you to the nearly 300 young surgeons who have already joined the YAG. If you are an arthroplasty resident, fellow or within your first five years of practice, and would like to join the group, click the button below. 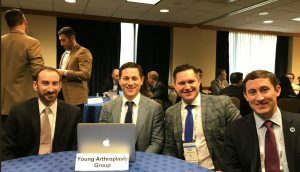 The AAHKS Young Arthroplasty Group (YAG) has been formed and charged with connecting young arthroplasty surgeons who are less than five years in practice. YAG promotes collaboration and young surgeon activity within AAHKS with particular focus on research, leadership and advocacy. AAHKS leadership created the Young Arthroplasty Group Committee to direct the work of the group and has populated the committee with energetic surgeons who are eager to help the group grow and offer our members meaningful benefits. The committee is comprised of a chair, vice-chair, two AAHKS leadership line representatives, and five liaisons. Committee positions are either one or two-year terms, and will be repopulated through the AAHKS committee appointment program. One of the most important efforts currently for AAHKS is in the realm of advocacy. One great opportunity that exists for our young surgeons is the AAHKS Health Policy Fellowship. This two-year fellowship provides hands-on experience with both national health policy and AAHKS Leadership activities. For those who have already participated, the fellowship has been an eye-opening and invaluable experience. Click here for more information and how to apply! Another vital advocacy resource for our members is the Orthopaedic Political Action Committee (OrthoPAC) of the American Association of Orthopaedic Surgeons, which acts as our political action voice on Capitol Hill. Contributing to this PAC has many benefits and, as a group of young surgeons, we have an opportunity make a difference now and far into the future. We encourage our group members to consider a contribution. Signing up is easy, and every contribution counts! Click here for more information, or text the word AAHKS to 41444 to give now. Any amount of contribution helps! AAHKS is a member of the PAC’s Advisor Circle at the highest level, learn more.